"Affordable luxury in the heart of the "H" Street Renaissance! Blocks from Union Station, Senate Square! 1 Bedroom and den, 1 bath, in-unit full-size washer/dryer, great living room, kitchen! Kitchen features granite countertops, stainless appliances, terra cotta tile floor! Hardwood floors throughout! Large closets and an awesome deck! 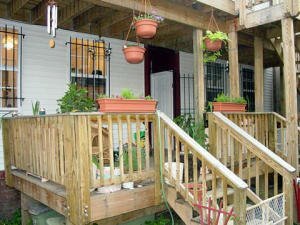 Unique four-unit building renovated in 2004, great neighbors, pet friendly. Harris Teeter, trolleys, an awesome farmers market, new restaurants, nightlife, theaters, a yoga studio and much more makes the H Street Corridor the new place to be!" Located at 703 8th Street NE along the up and coming H Street Corridor NE in Washington, DC. It is priced at 329K. It has 737 sq. feet. Taxes are 2235. HOA are 205. Notice the bars on the back porch. This is still a sketchy neighborhood. 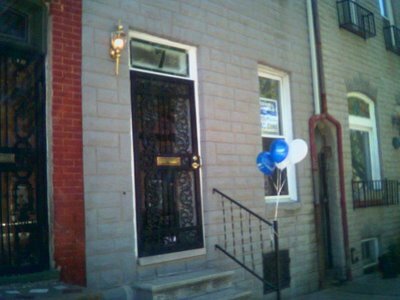 Also in the Craiglist ad there are 4 picture but none of them are of the front of the building. Why? Today, there is an open house from 2 - 5pm (April 30th). It has been on the market for 22 days. Will it sell at 329K? Very unlikely. It is too expensive for this area. The condo market in Washington, DC area is continuing to decline significantly. They will need to reduce their price. No Risk of Paying Too Much for a Condo? The National Association of Realtors now has their very own blog. Hat tip to NYTimes WalkThrough Blog for finding the blog. Now, the NAR can blog just like the bloggers in the BubbleSphere. I wonder if the blog will allow non anonymous users to post bubblicious comments. Anyone want to try? Due to unforeseen circumstances we need to assign our unit over to someone else. Please contact me to discuss the details. The price of this condo will be very appealing! This condo unit is in the second building of the Halstead at Dunn Loring which is not yet completed. Could the 'unforeseen circumstances' have anything to do with 'the bubblicious bench' right across the street at building one of the Halstead? Easy Money at The Bank? "Your're in Contol. Pay interest only on the amount borrowed*." Are you really in control? H*ll no, at maturity you are at the mercy of current interest rates as the fixed interest only period last for two years. Are there any banks out there that are more responsible? Banks that don't promote all this 'easy money' and 'debt is freedom' mentality? To bad I have some of my money at Chevy Chase Bank. David Lereah, chief economist for the National Association of Realtors said some unexpected things recently. My favorite Lereah quote is "If you have a healthy local economy it is almost impossible to have a bubble burst!" Yikes! "In the statement issued after its March meeting, the FOMC noted that economic growth had rebounded strongly in the first quarter but appeared likely to moderate to a more sustainable pace. It further noted that a number of factors have contributed to the stability in core inflation. However, the Committee also viewed the possibility that core inflation might rise as a risk to the achievement of its mandated objectives, and it judged that some further policy firming may be needed to keep the risks to the attainment of both sustainable economic growth and price stability roughly in balance. In my view, data arriving since the meeting have not materially changed that assessment of the risks. To support continued healthy growth of the economy, vigilance in regard to inflation is essential. "The FOMC will continue to monitor the incoming data closely to assess the prospects for both growth and inflation. In particular, even if in the Committee's judgment the risks to its objectives are not entirely balanced, at some point in the future the Committee may decide to take no action at one or more meetings in the interest of allowing more time to receive information relevant to the outlook. Of course, a decision to take no action at a particular meeting does not preclude actions at subsequent meetings, and the Committee will not hesitate to act when it determines that doing so is needed to foster the achievement of the Federal Reserve's mandated objectives." Ben Bernanke, spoke today before the Joint Economic Committee, U.S. Congress regarding the US Economic Outlook. Based on the information in hand, it seems reasonable to expect that economic growth will moderate toward a more sustainable pace as the year progresses. In particular, one sector that is showing signs of softening is the residential housing market. Both new and existing home sales have dropped back, on net, from their peaks of last summer and early fall. And, while unusually mild weather gave a lift to new housing starts earlier this year, the reading for March points to a slowing in the pace of homebuilding as well. House prices, which have increased rapidly during the past several years, appear to be in the process of decelerating, which will imply slower additions to household wealth and, thereby, less impetus to consumer spending. At this point, the available data on the housing market, together with ongoing support for housing demand from factors such as strong job creation and still-low mortgage rates, suggest that this sector will most likely experience a gradual cooling rather than a sharp slowdown.However, significant uncertainty attends the outlook for housing, and the risk exists that a slowdown more pronounced than we currently expect could prove a drag on growth this year and next. The Federal Reserve will continue to monitor housing markets closely. More fedspeak from the feds. Ben's soft language used to describe the housing market's decline is disappointing. It is misleading. 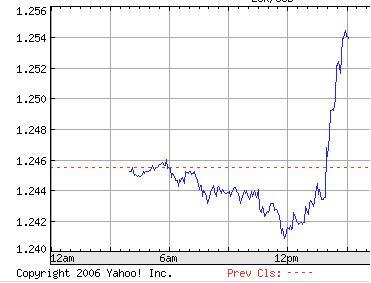 The market understood Ben's speech as meaning that interest rate hikes will end soon. Hence, the dollar declined significantly against the euro. Another Casualty of the Housing Bubble? Building being torn down in Washington, DC. Did the headlines in the media properly reflect the significant information from the new home sale report? Sure, seasonally adjusted new home sales increased by 13.8 from February 06. 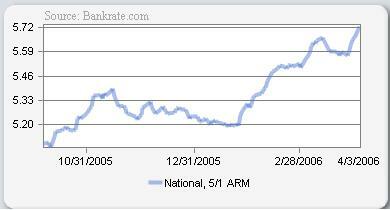 However, this was still down 7% from March 2005. "The median new home price slipped 2.2 percent from a year earlier to $224,200, the first year-over-year decline since December 2003, the Commerce Department said"
"The 555,000 units of inventory is another all time record for new houses for sale. On a months of supply basis, inventory is significantly above the level of recent years." [Calculated Risk]. Up 25% from March 2005 when inventory was 441,000. A much fairer headline could read 'March New Home Sales Data Mixed'. The media should be ashamed of their headlines regarding the new homes sales data. It is misleading. The real news is that the year over year (YoY) numbers for both the number of sales and median sales price declined. Additionally, inventory of unsold new homes increased 25% YoY from March 2005. All, this leaves aside the whole question of the value of the initial housing numbers from the Census Bureau as they have large amounts of uncertainty which the Census Bureau readily admits. The revised are much more trustworthy. The US Census Bureau reported new home sales for March. Sales of new one-family houses in March 2006 were at a seasonally adjusted annual rate of 1,213,000, according to estimates released jointly today by the U.S. Census Bureau and the Department of Housing and Urban Development. This is 13.8 percent (±14.9%)* above the revised February rate of 1,066,000, but is 7.2 percent (±12.8%)* below the March 2005 estimate of 1,307,000. The median sales price of new houses sold in March 2006 was $224,200; the average sales price was $279,100. The seasonally adjusted estimate of new houses for sale at the end of March was 555,000. This represents a supply of 5.5 months at the current sales rate. Check out The Housing Bubble Blog and Calculated Risk Post I and Calculated Risk Post II. "So we have, through trillions of dollars of debt accumulation, created a de facto dollar standard in much of the world economy." "The debt is based, however, on a worldwide bubble economy, perhaps the biggest bubble in world history. The whole theory behind this comprehensive "bubblization" (a new word for you, referring to the combination of federal deficit, trade, mortgage, housing, and dollar bubble working together) has grown out of the economic theories of the Fed." From the Demise of the Dollar by Addison Wiggin p88. Mr. Wiggin writes the Daily Reckoning newsletter. I am currently reading this most informative book. Almost done. The big news in the NAR Existing Home Sales Report is the condominium and cooperative sales. Nationally, condo & coop inventory increased to 494,000 in March 06 from 425,000 in February 06 which represents a 16.2% increase in inventory in one month. Year over Year the inventory increased from 267,000 units to 494,000 which represents a dramatic 85% increase. There is now a 6.9 month supply of condo /coop inventory. Sales fell 2% from March 2005. The median sales price for condos in the West actually fell 3.7% (not seasonally adjusted) from March 2005. In March 2005 it was 290.4K which has since fallen to 279.6K. Overall, the condo & coop market is much more vulnerable then the single family housing market. Much more inventory is coming. Median sales price will decline. The construction crane is now the unofficial bird in many states. The National Association of Realtors (NAR) just released their existing home sales report. Total existing-home sales including single-family, townhomes, condominiums and co-ops  rose 0.3 percent to a seasonally adjusted annual rate of 6.92 million units in March from a pace of 6.90 million in February, but were 0.7 percent below a 6.97 million-unit level in March 2005. Single-family home sales rose 0.3 percent to a seasonally adjusted annual rate of 6.07 million in March from 6.05 million in February, and were 0.5 percent below the 6.10 million-unit pace in March 2005. The median existing single-family home price was $217,300 in March, up 7.8 percent from a year ago. Existing condominium and cooperative housing sales increased 0.2 percent to a seasonally adjusted annual rate of 854,000 units in March from a level of 852,000 in February, but were 2.0 percent below the 871,000-unit pace a year ago. The median existing condo price was $225,500 in March, up 6.1 percent from March 2005. Did the NAR mention in their press release that the national inventory has increased 39% Year Over Year? Definitely not. That was left to the bubble bloggers. David Lereah the chief economist (paid shill) for NAR had this to say "It's a good sign to see home sales holding close to the level of a strong rebound in the month before," he said. "This is additional evidence that we're experiencing a soft landing. We may see some minor slowing in home sales as interest rates rise, but the market clearly is stabilizing"
David 'Soft Landing' Lereah must be salivating that these March numbers can be spinned to support the soft landing position. 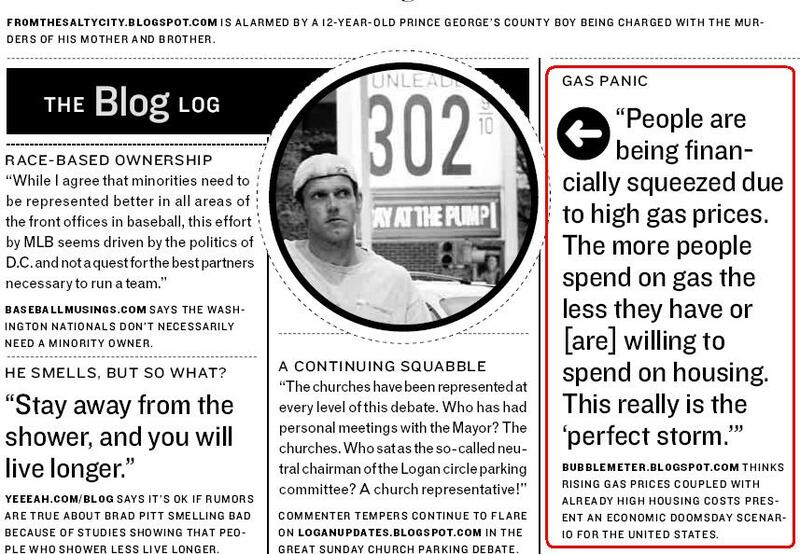 Bubble Meter Blog was quoted in the Washington Post Express today. "People are being financially squeezed due to the high gas prices. The more people spend on gas prices the less they have or [are] willing to spend on housing. This really is the 'perfect storm.'" BUBBLEMETER.BLOGSPOT.COM Thinks rising gas prices coupled with already high housing costs present an economic doomsday scenario for the United States. Check out an interesting post about home builders reducing prices. 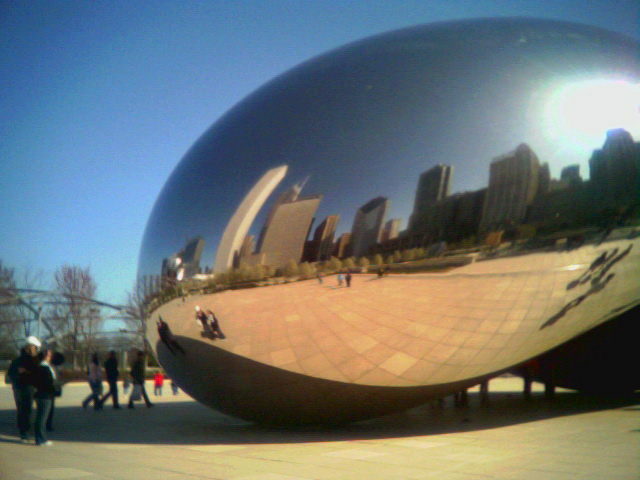 The Bean in Millennium Park in Chicago. Oil just hit 75$ a barrel on Friday. Prices at the gas pump are way up compared to last year at this time. Crude topped a record 75 dollars per barrel in New York trading Friday, five dollars up from a week earlier. Consumers are getting squeezed. AP Reported "Self-serve regular averaged $2.91 a gallon, up from $2.67 two weeks ago, said Trilby Lundberg, who publishes the nationwide Lundberg Survey of 7,000 gas stations. Mid-grade hit $3 a gallon, up from $2.76, while premium climbed to an average of $3.10, from $2.86 two weeks ago." Check out this Gas Price Google Mashup. Very Neat. So much happening in the Bubble Sphere. Tough to choose. Condo Reversions? These are condo conversions that have reverted back to rental units. The developers must be getting crushed here. Mish reports about Condo Reversions in Florida. "There is no longer any doubt that Florida is ground zero of the bubble bust. The only debate is how quickly the mess spreads." Hurricane season begins about 5 weeks. The housing market is a disaster down in the 'tropical paradise'. Economicrot hits 25,000 page views. Lots of terrific information about macroeconomic trends that are occurring. Check it out. Angry Bear has a short but sweet post Oil Price Over Time in Real Terms. Don't forget about the other local DC area housing blogs. 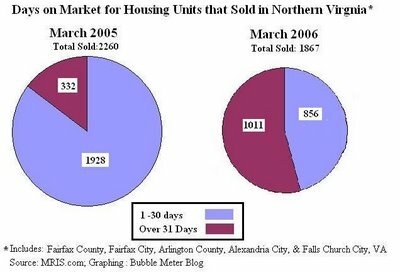 DC Bubble, The Housing Bubble in Washington, DC, and Northern Virginia Bubble. Seattle Bubble has post about a an email he received from an owner of a real estate website titled Some Kinda Email. Good read. Bill Fleckenstein writes The housing bubble has popped in his column called Contrarian Chronicles. Solid. P.S. This week is expected to be another very busy week in the BubbleSphere. Any citizen reporters want to report on their real estate observations. What is happening on the ground? Anyone attend open houses this weekend? How was traffic? The single family home (sfh) located at 1413 N Monroe Street , Arlington, VA is available for sale at a reduced price of 595K. 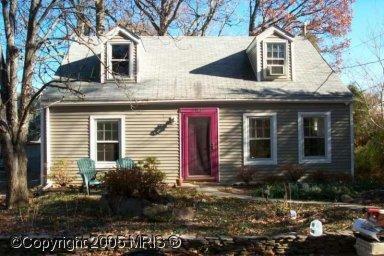 It is a 3br, 2ba home located on 7,405 sq feet of land. "Charming cottage like house at the end of a dead end street-most harming- hardwood floors- sunny house with lots of windows - some new-2 full updated baths-good size rooms-beautiful back yard-owner has a green thumb-newer roof-steam heat and window air cond. Convey-close to two metros-house vacant-show and sell!" It has been sitting on the market for 128 days. The house was originally listed on the market 679.9K. Here is the price reduced history from Zip Realty. The house is located right near the desirable Orange line corridor in Arlington. The location is probably somewhat noisy as it is located about a block from interstate 66. A special thanks to the reader who alerted me of this property. Will it sell at its reduced price? Those who had been riding the upward wave decide now is the time to get out. Those who thought the increase would be forever find their illusion destroyed abruptly, and they, also, respond to the newly revealed reality by selling or trying to sell. And thus the rule, supported by the experience of centuries: the speculative episode always ends not with a whimper but with a bang. A soft landing will NOT happen in the bubble markets. There will be a bang. A hard landing scenario is inevitable in many metropolitan areas across the country. The Bubble Meter Blog was mentioned in a front page article in today's Washington Post. The article is titled 'Doors Close for Real Estate Speculators'. Kirsten Downey, the Washington Post reporter, did a phenomenal job reporting on the speculative episode that is occurring in the metro Washington, DC housing market. Read the article; not just because she mentioned my blog. Some projects became particular investor magnets, and, more recently, the subject of real estate blogs criticizing speculative excesses. For example, the local Internet blog Bubble Meter focused last month on what it called "the bubblicious bench." At one recently completed condominium called the Halstead at Dunn Loring, a luxury condominium complex in Fairfax County, a park bench outside the building bristles with real estate agent lockboxes to permit vacant units to be shown to prospective buyers or renters. On a recent morning, there were 49 lockboxes there, outside a building that has about 200 units. Thanks to all the readers who informed and congratulated me on the Washington Post article. You all rock. Bubble Meter will continue fighting the good fight! The latest promotion for the Mica Condos in downtown Silver Spring. Despite the release of the minutes from the FOMC meeting, Bubble Meter is still predicting that the Federal Reserve will stop raising short term interest rates once it reaches 5.25 in June. The Fed may raise rates to 5.5%, although 5.25% is much more likely. How high will the Federal Reserve raise interest rates this year? Why? At Mish's Global Economic Trend Analysis tells of nonprime lender Acoustic Home Loans that is now out of business. "Acoustic was the 27th-largest nonprime wholesale originator in the nation." Guess where they are located in Orange County (OC), California. Very appropriate. 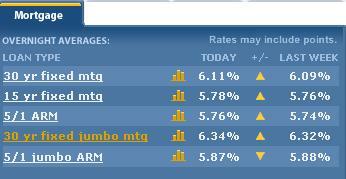 Keep you eye on the rising mortgage interest rates. "Rates on 30-year mortgages climbed this week to their highest point in nearly four years, a development that could put a further crimp in housing activity" 'Could'? It will. The only question is: how much of a 'crimp'? Housing.com Blog is doing a super job keeping up with the housing market and all it's excesses. Check out the new and very promising New Mexico Real Estate Blog. I am still on vacation so postings will be light. Cheers. Here is a partial list of the housing markets that are particularly interesting. Los Angeles - Aka 'Epicenter of the housing bubble.' Huge market where prices are way out of whack with median incomes. 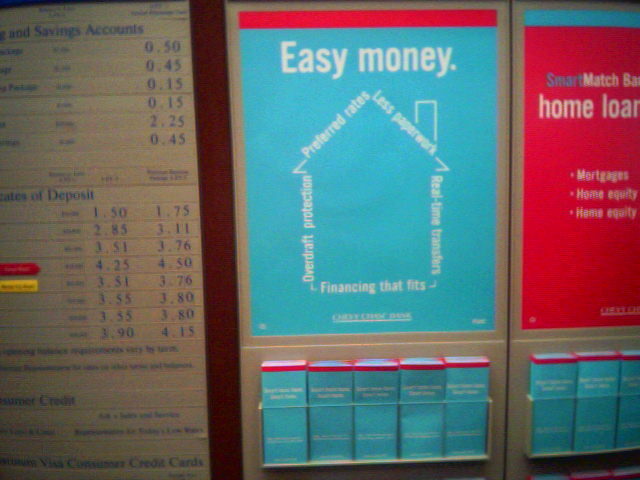 Las Vegas - Not only do they gamble in casinos, but here they gamble in the mortgage broker's office. The Las Vegas economy continues to be VERY dependent on the housing industry and tourism. Bakersfield - Central Valley, California. Incomes way out of line with housing prices. Price have more then doubled in the past 5 years. Where are the high paying jobs to support the surge in home prices? Miami - Where the construction crane is the unofficial bird of Miami. The condos developments have inundated by flippers looking for a quick buck. Inventory has rapidly risen in the past year especially for condos. The hurricane season starts in a month and a half. Washington, DC - "It is different here" says some as they point to the Federal government and all the high paying contractor jobs. Is it? Will the Washington, DC area see significant price declines? Which housing markets do you find fascinating? The house located in Skokie, IL that I have reported about twice has still not sold. The hefty 699K price tag still stands as there have been no more price reductions. The MLS number is 06003346. Clearly the seller is in no rush to sell it. Iif they want to sell it in a reasonable amount of time they need to significantly lower their price. Will it sell at 699K? Postings will be light over the next week as I am on vacation. These past few weeks have brought a tremendous amount of evidence that in the bubble markets there will not be a soft landing but rather a hard landing. Check out the story about the Homeless Man Gets Five Fannie Mae Loans In Florida. D*mn. The fraud needs to be investigated and prosecuted. How widespread is the mortgage fraud? The number of lockboxes on the bubblicious bench, as of Saturday, April 8th was 48. 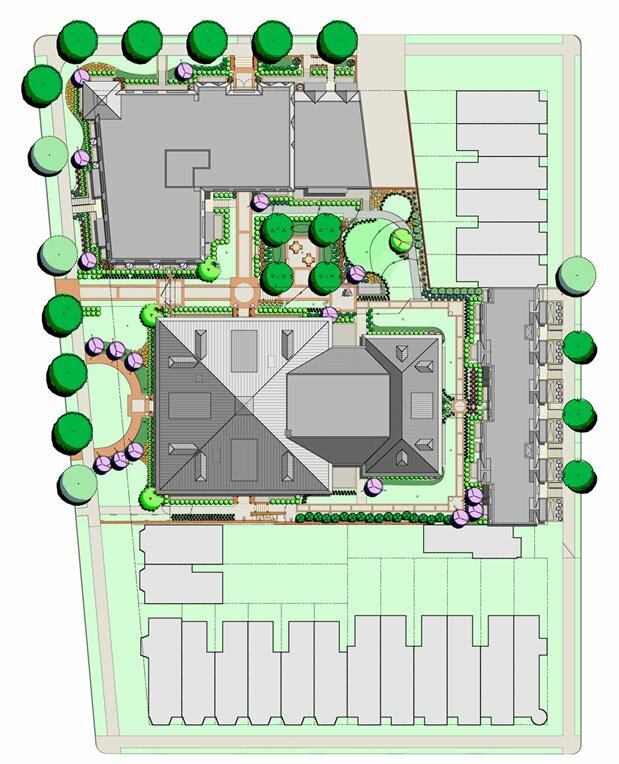 There are 2 buildings comprising the Halstead development, the first has been completed and the units have been released; the second building will, according to an owner in the first, be coming online in 6-9 weeks. After having viewed the inside of the building, the total number of units in the 1st building is approximately 220. Given that the number of lockboxes is at 48, and the only units that would be subject to sales on the market are those in the first building, this means that approximately 20% of ALL available units in the development are on the market at this point. The fact that at least 48 units from the first unit are on the market now, and that the 2nd (and, based on my observation, bigger) building is coming onto the market in a few months, there should be an overwhelming supply of Halstead units coming onto the market, depressing the price and further straining the flippers that are trying to sell in a less than ideal location. Source: MRIS; [Click on image for larger version]. Active listings for housing units have increased dramatically in the Washington, DC metro area in the past year. 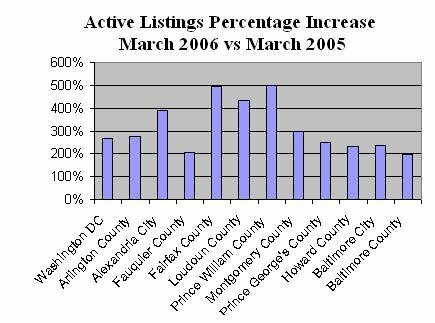 The chart on the right shows the active listings percentage increase year over year (YoY) for March 2006 in the larger various jurisdictions that comprise the DC Metro area. In Prince William County, VA, an exurban area, the inventory has increased almost 500%. T he speculators are trying to sell, and buyers are balking at the high prices. The April numbers are expected to show an even higher YoY percentage increase. Stay Tuned. In case you haven't received the memo, the housing boom in Washington, DC is over. The housing bubble is popping as inventory explodes, sales drop, speculation wanes and prices fall. All these numbers include condo units. In Washington, DC for the month of March 2006 the median sales price was $397,000 which represents a decline of .75% from March 2005 when the median sales price was 400,000. The average sales price also fall, in March 2005 it stood at $490,024 which represents a decline of 5.13% from March 2005 when the average sales price was $516,515. Additionally, the number of housing units sold in DC for the month of March 2006 was 651 which represents a decline of 20.32% from March 2005 when 817 housing units sold. Source: MRIS. The major papers in the area (Washington Post, Washington Times, City Paper) need to inform the public about this ASAP. We now have Year over Year (YoY) price declines in Washington, DC proper. This post does not directly deal with the housing bubble. Rarely, do I stray from the topic at hand. However, I was there and I wanted to share my observations from the march and rally. The blogosphere needs to be represented in the ground reporting. Immigration will be a very important issue in the coming years. 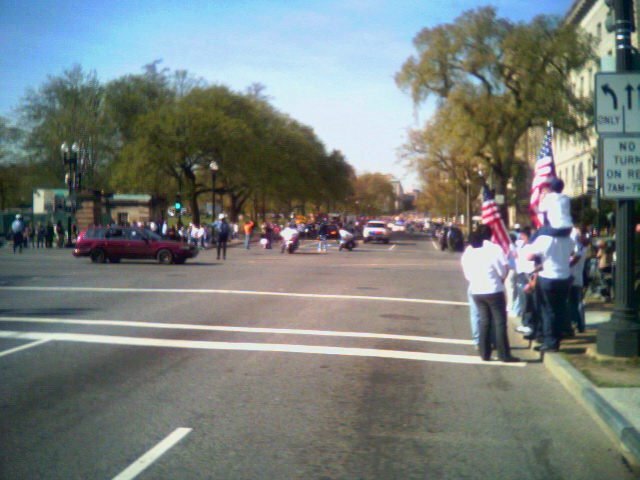 The weather was perfect for the rally and march which surely contributed to the impressive turnout. The numbers are huge. Initial estimate for immigration protest rally in Washington, DC is 180,00 to 350,000. 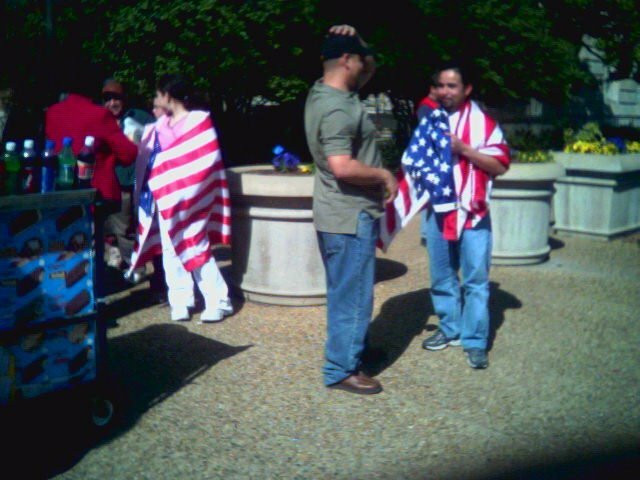 Some of the protester wanted amnesty for the illegal immigrants. Metro announcements also in Spanish. Normally Metro subway announcements are just in English. Mainly Americans flags were waved. Some people carried Mexican Flags, El Salvador. Lots of people dressed in white as that is one the color chosen by the demonstration organizers. Some of the marchers were chanting slogans and also "USA, USA"
Aministia, Full Right for all Immigrants"
"1st generation American, Mexican American, my vote will count in 2008"
Lots of "We are America"
"Love Thy Neighbors, Neighbors are not a felony"
"I'm for legal immigration" - white Caucasian holding sign. Justice 4 Immigrant, Justice 4 All"
More pictures may be posted later on. Stay tuned. This past week was a major week in the bubblesphere. The evidence continues to mount that the spring season is not the bubble savior that the housing industrial complex want it to be. For you local DC Readers, check out the DC Under Construction Blog. Very Cool. OverPrice DC has a nice graph showing rising inventory in DC proper. Check out the new David Lereah Watch blog. Started by yours truly. 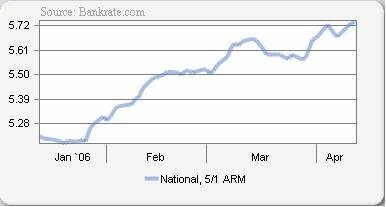 Don't forget that mortgage rates continue to rise. Finally, Overvalued Blog is doing a terrific job at finding all these over valued housing units. This graph speaks for itself. Click on image for larger version. with the median down to $650,000 from the $669,154 high in 2005. Active listings up 390.3%, with the median flat and average price down. Active listings up 291.7%, and the median is higher with only one home sold under $500,000. Active listings up 204.3%, with a median at $390,000, down from $419,950 in 2005. Active listings up 496.4% with the median and average price down from the 2005 highs. Active listings up 434.7% with a year to date decrease in contracts of 23.5%, The median is down $5,000, even with triple or double digit declines in price ranges beneath $500,000. Active listings up 497.2%, with a flat median price even with big declines in price ranges below $300,000.Compared to 2005, contracts are down 26.4%, year to date. The only two condo and co-op reports were pulled up; Loudon County which saw an increase in active listings of 608.5% and a decline of year to date contracts of 21.3%. 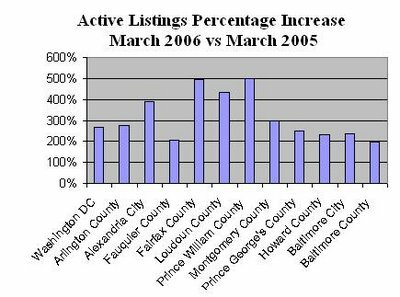 And Prince William County saw an increase in active listing of 800% and a 16.3% decline in year to date contracts. These number are incredible. Inventory is exploding and the median price is falling in many of the Northern Virginia jurisdictions. This is major news in the Washington, DC bubble zone. The spring season will not save this bubble. 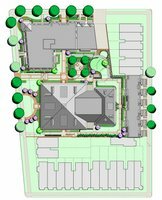 The condo / townhouse development called Parker Flats at Gage School is currently being marketed. 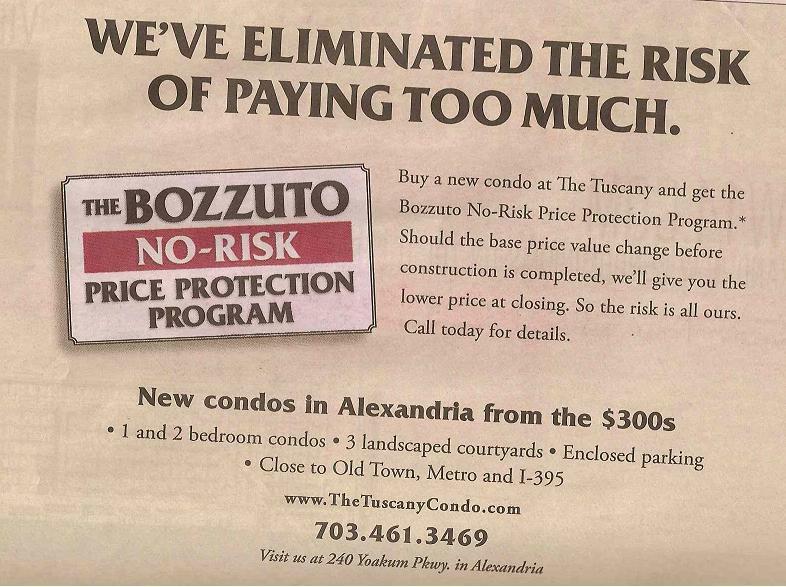 Here, the top of the webpage it still says "Urban Condos from the $300s" (as of 4/6/06). But found this line in an email advertising for the condo development today [4/5/06]: "Homes are priced from the low $200,000's for a studio flat to the $500,000's for a 2 bedroom in the historic school.."
Thus originally studios were priced from the 300's and now the studio's are going in the low 200's. Hmm... who is going to pay over 300 for a studio? "and we anticipate delivery to take place in early 2007*." "Parker Flats is an exciting community of 92 condominium residences providing uncompromising quality and value." "Located just a few blocks from Howard University, Parker Flats blends all the historic features of the Gage School Building a DC landmark - with exciting modern conveniences. " "Parker Flats means living between U and V streets, and Flagler and 2nd streets in Northwest, near Metro, Howard U, and much more." It is located in Washington DC's Bloomingdale neighborhood which is a gentrifying neighborhood located about 2.5 miles north of the US Capitol. Thanks to a citizen reporters who sent this location in. The Ownership Society or Debtship Society ? There are a huge number of bubble markets across the USA. What is a bubble market? A bubble market is any area where residential real estate prices will decline more then 20% or more in real dollars [inflation adjusted] over the course of 3 years. In most bubble markets, the peak price was reached in late summer of 2005. Many bubble markets will experience real price declines much greater then 20%. Some may experience price declines of 60% in real dollars over the course of 3 years. As learned from real estate history, some bubble markets may keep on declining for more then 3 years. What has happened in the bubble markets in the past 8 months? So what can we expect over the next year in the US with regards to the housing market? YoY price DECLINES in most bubble markets. Check out the Live Housing Economics Chat on WashingtonPost.com. You can submit questions. It started at 12pm EST 4/5/06. Don't you think that prices for condos in the DC area will fall significantly given all the speculators trying to sell? Neil Irwin: This is a pretty remarkable photo. It is a rather vivid illustration of just how much the market has shifted from a year or two ago, when you read of people lining up by the hundreds for chances to buy. There is clearly immense supply of condos out there now. Whether this means condo prices will actually decline depends primarily on whether individual owners and developers drop their prices to a market-clearing price, or hold out indefinitely waiting for buyers. 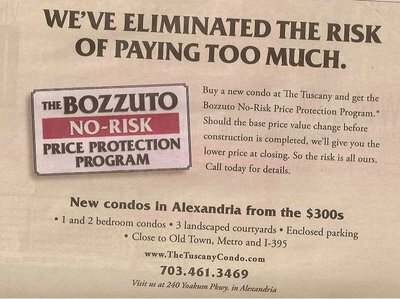 I have a colleague who bought a well-located D.C. condo in 1988, I believe, and sold it in 1998 for $10,000 less than she paid. Many buyers in recent years have done so without understanding that there can be long down or flat cycles in real estate, in addition to periods of extraordinary appreciation. Washington, D.C.: We are in our mid 20's and looking to buy our first home. We realize that we could only afford a condo and want to stay in the city. We have been approved for far more than we can afford can actually afford monthly with a rate at 6.75% and 0 points. I am noticing a huge glut in condos and fear the condo market in D.C. will bottom out sometime soon. Are we at risk for buying an expensive 1 bedroom condo in the city to only lose money on it 4 years from now? Neil Irwin: Are you at risk? Yes. Buying real estate for a four year time horizon, especially in the particularly volatile condo market, is by definition taking a significant financial risk, particularly given the leverage involved in making the purchase. That doesn't mean you shouldn't buy, it means you should only buy if you are prepared to take that risk, and will not be financially devestated if the condo market remains soft (or gets softer). Suitland, Md. 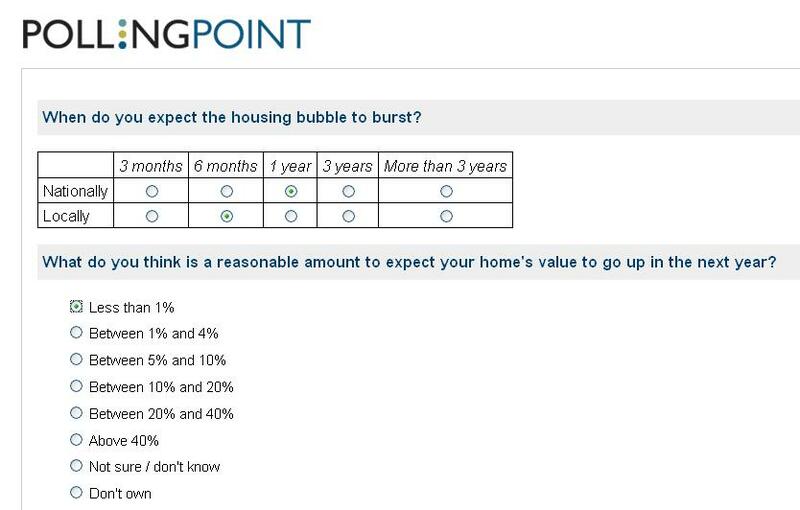 : Your last response implies that 'over the next couple of years' the region will see further housing price softness. Would you explain why you hold that view? Neil Irwin: That's not necessarily my view. My view is that there is real risk that the region will see furhter housing price softness, based on the way previous real estate cycles have played out. There's a reason they call it a cyclical industry. 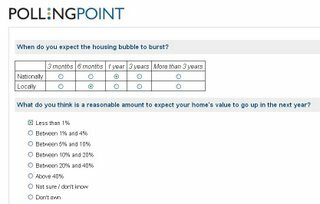 I'd turn the question around though: What examples can you find from the past of real estate prices doubling or tripling in a seven year period, then having a slump of a few months and then immediately resuming a meteoric rise? If there are historical precedents for that, I'd love to hear about them. 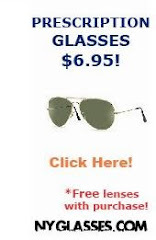 I'm not aware of any. Arlington, Va.: but DC is "different". they aren't making anymore land. babyboomers retiring and buying second homes. so sayeth NAR chief economist David Lareah, has anyone noticed that economists and weathermen are the only jobs where you can make completely assinine predictions and still keep your job? Neil Irwin: Another thought from a reader . . .
RE: Richmond: A lot of young professionals share housing with several others their age and find a way to save money on small saleries. You might suggest this to your son. This is what i did when I first arrived, and saved enough for 20% down on a condo (it also helps to save in other areas - like not going to happy hour every night). Arlington (Waverly Hills), Va.: I've been noticing that the doom and glommers are out in full force now that the housing market is starting to slow. I'd love to see an article in the Post that tracks some of the more prominent economic forecasts. Some economists / prognosticators continually predict a recession year after year. Then when one finally ocurrs, they say take credit for predicting it. What they don't take credit for is missing wildly on their forecast in the previous 10 years. Neil Irwin: You're right that there are perma-bears out there in the economic analysis game. But I would argue that the same exists on the other side of the optimism/pessimism scale. There are a ton of analysts out there who have a rosy view of the future at all times. I most value the economists who are genuinely unpredictable and offer fresh analysis, and don't get locked into one prism through which to view the economy. That is a small selected group of the most interesting questions asked during the live chat session. The bubbleheads won this chat session. :-) Good job to my fellow bubbleheads in the metro DC area. Check out this biased PollingPoint Question. China should gradually reduce its holdings of U.S. debt and can stop buying dollar-denominated bonds, a Hong Kong newspaper on Tuesday quoted Cheng Siwei, a vice chief of China's parliament, as saying. With China a leading financier of the U.S. current account deficit, Cheng's comments sent the dollar lower against the euro and yen and also pushed down prices of U.S. government bonds. The Beijing-funded Wen Wei Po daily carried Cheng's comments, made in Hong Kong on Monday, but it was not immediately clear whether they reflected those of top decision makers who determine the content of China's reserves, the world's largest. Cheng is one of more than 10 vice chiefs of the parliament and usually speaks on economic policy. His rank is equivalent to vice premier, outranking cabinet ministers, but he does not have specific responsibility for economic policy. Some of the Chinese holdings of US debt are mortgage backed securities. Even if China does not reduce its US debt holdings and merely decides to stop buying US debt that would significantly raise borrowing costs for various types of US debt including mortgages. Remember 8 or 9% mortgage interest rates? The Mica Condos are a condo conversion project located in downtown Silver Spring, MD [suburban Washington]. 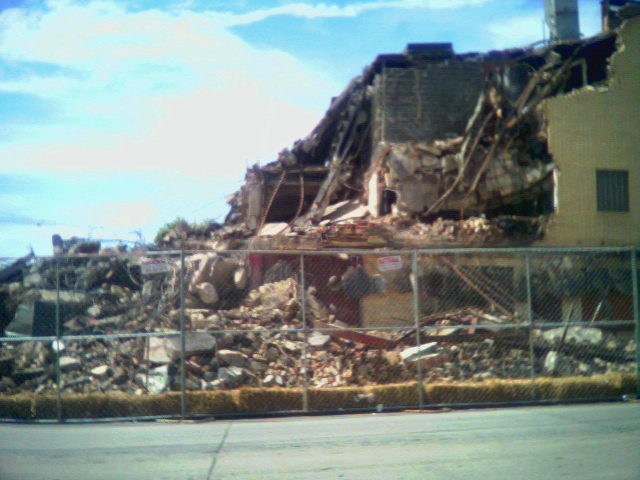 The building used to be called Springwood Apartments. There are 140 units in the building. 82 of them have sold so far [as of 4/1/06]. There are 17 studios in the building. All have sold for prices in the very low 200's. Condo Fees per month: Studios $240 a month, 1BR $390, 2br/1ba $459, 2br/2ba $645, 3br 2.5ba $716. Includes "Electric, Natural Gas, Water & Sewer, Pool,, Club Room w/ Billboards, Media Center, Fitness Center, Common Area Maintenance, On-Site Management, Reserves, Master Insurance Policy, Snow & Trash Removal"
The sales people are pushing Interest Only ARMs 3yr, 5yr, 7yr or 10yr. There are only three companies that can do the loans George Mason, CountryWide and Wells Fargo. The Realtors' chief economist, David Lereah, said most of the cooling in the housing market has already happened. "We can expect a historically strong housing market moving forward, earmarked by generally balanced conditions across the country and fairly stable levels of home sales with some month-to-month fluctuations," Lereah said. Bankrate is a terrific site that has a wealth of wonderful information about various type of loan products. The Boy in The Big Housing Bubble has interesting piece about house raffles. Super post about the Sacramento housing market. Finally, Bubble Markets Inventory Tracking blog has been tracking bubble markets and announced that housing inventory hit 40,000 in Phoenix metropolitan area. Phoenix is very bubblicious. The OCRenter notes "The inventory is starting to catch up to LA county. yet we are looking at a population base just a bit more than 1/3rd the size of LA county. very scary time for those Cali flippers in Phoenix... or is it Phoenix flippers in Cali..."
What is the economic outlook for US economy? As the housing market continues to decline it will drag the unsustainable US economy into a recession. A recession is coming soon. By late 2006, the US economy will be hurting. There are many other conditions that will contribute to the coming recession including the US budget debt & deficit, over reliance on consumer spending, the trade deficit, rising oil prices, hurricanes and a move away from the US dollar. You seem to be so pessimistic in you outlook. Some have called you a 'prophet of doom.' How do you see yourself? No, I am NOT a 'prophet of doom.' Rather, I am truthsayer. I tell the truth as I see it. Some others in the blogosphere are predicting a second great depression. I am predicting a moderate to severe recession, not a depression. 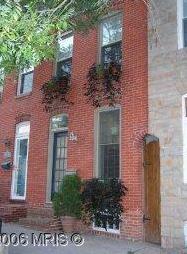 "Located in the heart of canton (walk to the square, patterson park,can company,etc. 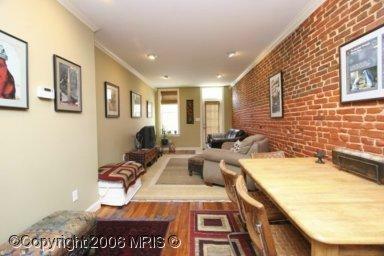 ),this 2 story thwse is a winner:refinished original pine floors,tons of exposed brick,pella wood windows. New kitchen features maple cabinets, stainless appliances, granite countertops and practical breakfast bar. Bathrooms offer italian marble tile; 2nd floor laundry. More! New rubber roof in 8/05." 2Br, 2ba, built 1920. It is long and narrow the rowhouse. The house is located in a neighborhood called Canton which is a pretty area of historic rowhouses next to the Baltimore waterfront. Located at 715 S Milton Ave in Baltimore, MD. MLS # BA5515257. It is priced at $349,900. It has been on the market for 66 days without any price reduction. 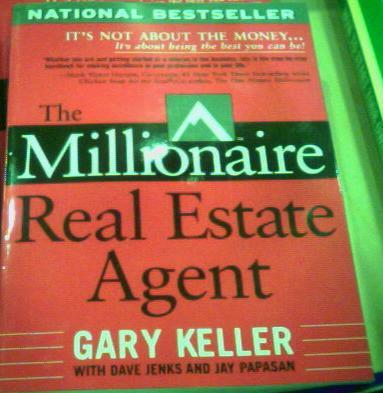 The book is called 'The Millionaire Real Estate Agent' but then right on the cover it says 'it's not about the money." Sure. :-( Picture taken while at Borders tonight. 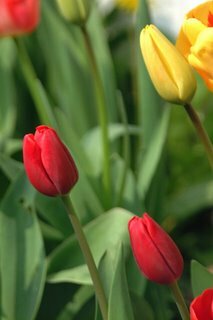 "When it's Spring again, I'll bring again Tulips from Amsterdam"